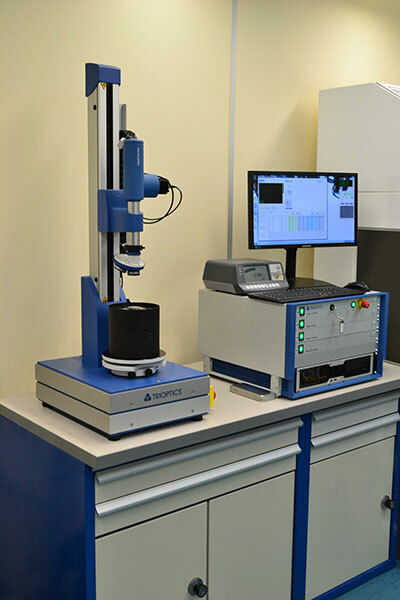 Resolve Optics announces that they have purchased a fully automated Modulation Transfer Function (MTF) and distortion test centre, plus a Precision Lens System Centring Station for its UK optical assembly facility. The addition of this specialist equipment, funded in part by the EU Horizon 2020 Big Camera Project, will enable Resolve Optics to improve the quality and performance of the specialist lenses it delivers to customers around the world. Peter Chamberlain, Production Manager at Resolve Optics commented “Due to the level of testing and detailed data increasingly required by OEM customers it was necessary to look at ways to automate and improve assembly and testing procedures. The new Precision Lens System Centring station will enable each element to be precisely centred during assembly. This increases the accuracy of the assembly and reduces distortion within the system”. He added “Modulation Transfer Function measurement test is an important aid to objectively evaluate the performance of optical systems. Not only does the MTF provide us with a means of expressing the imaging quality of optical systems objectively and quantitatively, but also provides the facility to accurately measure and map distortion”. Both the Centring Station and the MTF / Distortion test centre will greatly enhance Resolve Optics capability to efficiently manufacture and supply precision optical systems to all it’s customers.